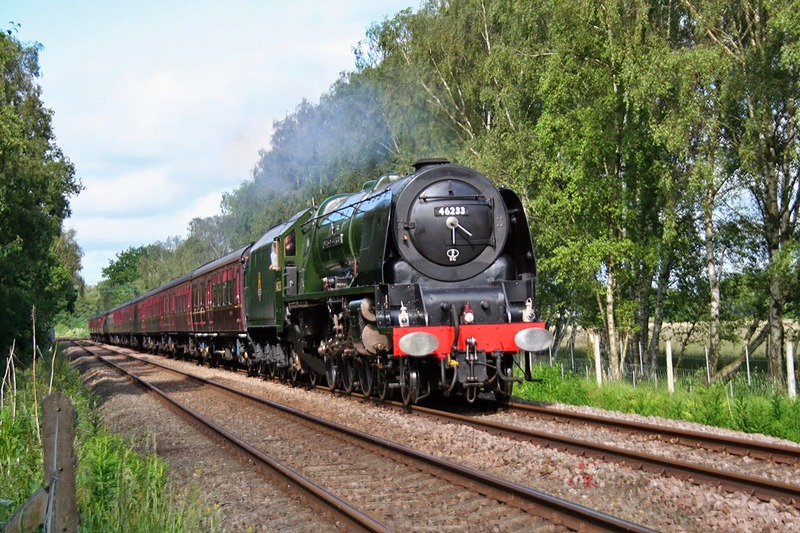 Correspondent Paul Beardsley has sent us some interesting steam engine movements over Network Rail lines, that occurred during June. 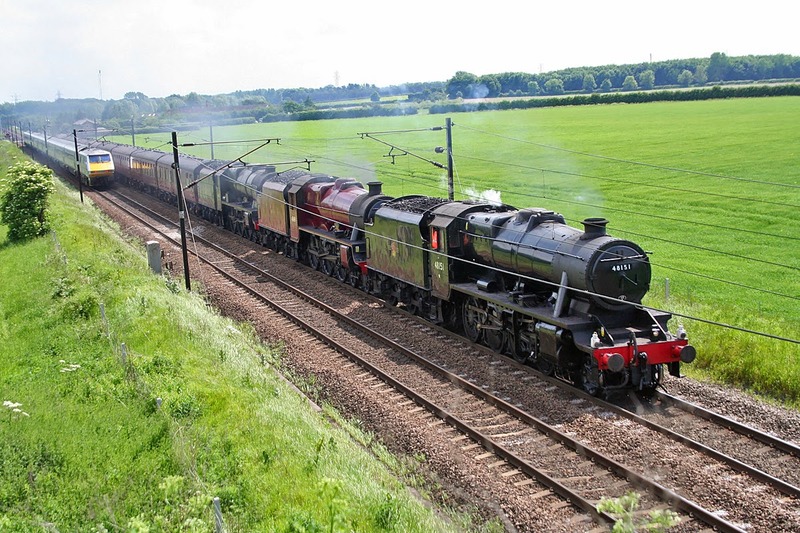 48151, 45699 Galatea and 46115 Scots Guardsman were in charge of 5Z50, 0759 Dereham U.K.F. to Carnforth Steamtown, returning from appearing at the Mid Norfolk Railway's West Coast Steam Gala held over the three days of 30th May to 1st June. Seen at Botany Bay, just north of Retford. Bit of a close shave though with the southbound service train! 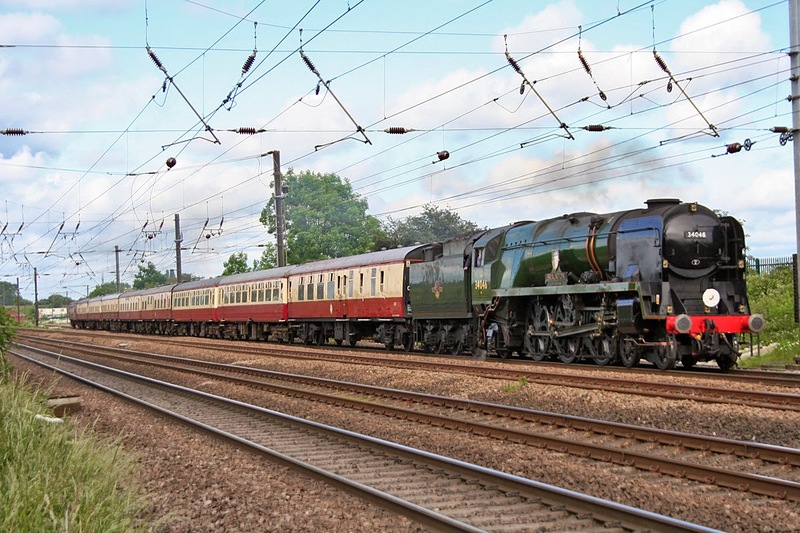 Then on Saturday the 14th June, 46233 Duchess of Sutherland in action and is seen at Strensall with PMR Tours The Yorkshire Coronation, 1Z48, 1615 Scarborough - Lincoln Central, which it was booked to work as far as Derby. The same day saw 34046 Braunton, race south at Copmanthorpe with UK Railtours The White Rose II, 1Z65, 1612 York - London Kings Cross. Braunton was standing in for 4464 Bittern which was unavailable and made what is thought to be it's first ever visit to York.